HyperLogic Professional Water Filtration is the commercial division of HydroLogic Purification Systems®, formed 15 years ago in response to increasing demand for professional and purpose-built water filtration systems specifically designed for growing cannabis. Today, modern techniques to grow premium cannabis on an industrial scale have been refined to a science, and water chemistry is widely recognized as a key component to success. By and large, successful growers now understand the importance of starting with a formula base of pure H2O. But why? What exactly is wrong with city or well water? In some industries like tomatoes, cut flowers or industrial ag monocrops, water chemistry doesn’t make much difference as the goal is primarily volume, not quality. With cannabis, greater care needs to be taken to produce top-shelf quality. Pure water does not contain the minerals and contaminants present in untreated tap water. The minerals in tap water are typically carbonates, a molecular form that is relatively immobile and therefore unusable by the plants. For instance, all plants need certain amounts and proper ratios of calcium and magnesium. Almost all untreated tap water has some calcium and magnesium, but they are almost always in the carbonate form and the ratios vary widely around the world. Calcium/magnesium carbonates are simply not efficiently absorbed by the roots of the cannabis plant. The carbonates need to be broken down (chelated) by either amino acids or other chelating agents, and this takes time… time that the professional cannabis grower, looking to be as competitive as possible, doesn’t have. A major water chemistry issue confronting industrial cannabis crop success is the dreaded “nutrient lockout.” This happens when untreated water with high levels of native cal/mag is used as a formula base and then nutrients are added at full strength, typically as directed by the nutrient manufacturer. Native carbonate cal/mag dramatically decreases the nutrient uptake efficiency; thus, the plant’s growth potential is completely undermined. By removing the native cal/mag from the tap water with a RO filter, and then replacing it with plant-specific and highly absorbable cal/mag nutrient formulas, the cannabis plant’s root system can absorb these essential growth ingredients much more quickly and efficiently. The exception to this rule is when nitrate balance is of primary importance. Organic cal/mag is nitrate free, but should only be introduced post-RO, along with specific amino acids to chelate the carbonate for maximum absorbability. Growers who use this technique are in consensus: Growth rates are greatly increased, and final yields are significantly larger. It’s no surprise that every major professional cannabis-specific nutrient company produces their own brand of cal/mag, including General Hydroponics and Botanicare. There are other forms of cal/mag available (citrate, sulfate, etc.) and each one has a unique absorption specification. But the bottom line is, plants need a consistent, steady flow of bioavailable cal/mag and the only way to make sure that happens is to begin with a nutrition formula base of purified water. Not only does untreated tap water have excessive mineral content or Total Dissolved Solids (TDS) but the consistency of any unpurified water source can vary widely from season to season at the same location. Trying to account for these seasonal changes through your fertigation system by monitoring fluctuating water chemistry and continually adjusting feed formula in response is a frustrating, time-consuming process. By removing the inconsistent variable of untreated tap water, the professional grower gains complete control over irrigation feed output. 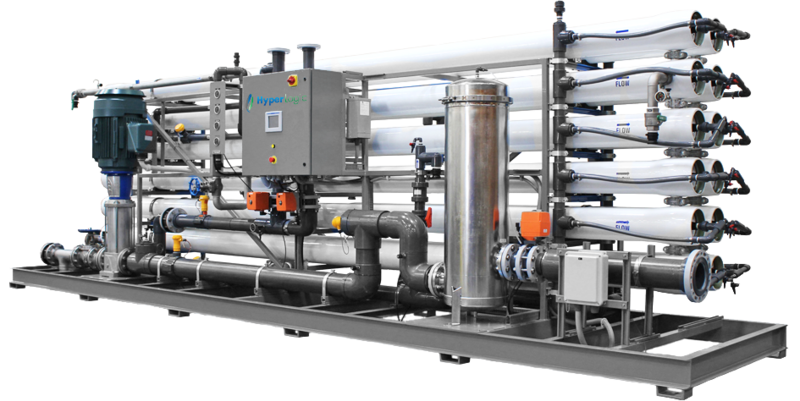 The relatively small investment in reverse osmosis filtering is returned almost immediately, through larger, heavier, healthier harvests and peace of mind. As the legal cannabis market expands around the globe so does the need for increased transparency and regulation around the purity of the product. Many agencies are already mandating heavy metal, pesticide, and fungicide testing. Without proper filtration, many contaminants make their way into the cell walls of the plant tissue. Water quality around the world is under threat and is continuously degrading. Only by using pure water as a base for vetted nutrient formulas can growers have 100% confidence that a crop will be regulated “contaminant free”. This is especially crucial if concerning any kind of organic or medical certification. Here’s an interesting issue that’s been popping up on the radar lately: A cannabis farm’s flowers may pass critical testing, but once processed into concentrate, contaminants compound. The final product, even if from the same source, fails. This is commonly seen in farms contaminated with Eagle 20, which was either purposely used, or inadvertently ended up in the air or water supply. Just because a batch flower passes, it is NOT safe to assume a concentrate will! Again, barring intentional use, the only way to be sure this doesn’t happen is to start with a base of purified water. There is only one cost-effective method of reducing both native minerals and TDS of untreated water: RO. It’s a technology that has been around for more than 60 years and, even though product to wastewater ratios have dramatically improved, no new technologies exist that will reduce contaminants as effectively or economically. No other media filtration, UV, ozone or any other method will remove, cal/mag carbonates, dissolved solids, and contaminants from source water. When it comes to healthy cannabis, the key is to lower TDS; only a proper RO system can effectively do that. The upshot: Anything else is an unnecessary waste of capital. While RO has taken some conservation criticism in the past, many refinements to RO over the years have made it an impossible process to beat, in terms of cost, energy and waste-water efficiency. HyperLogic currently offers the industry’s most efficient and cutting-edge machines. All products are hand built in California at an ISO-9001 facility. We have 15 years of solid experience in the cannabis market and have tens of thousands of loyal customers. We work with the largest, industry-leading commercial cannabis farms on the planet and have solved just about every cannabis/water problem imaginable. We know water and we know weed. Each system is custom designed for each facility’s unique water chemistry and logistic needs. We do not work with off-the-shelf, cookie-cutter solutions. Our staff of full-time dedicated engineers and tech support is second to none, and we also offer in-field service, start-up and training. Our philosophy is to provide the proper solutions to solve any water management issue at a competitive upfront cost. We design our systems so your ongoing maintenance and consumable requirements are minimized, by keeping upfront equipment costs affordable and operating costs at a minimum. We set our customers up for success by giving them a competitive advantage over their competition.